Properties in Tarouca average 4.7 out of 5 stars. 3 bedroom accommodation in S.Martinho d. Mou. Property 32: 3 bedroom accommodation in S.Martinho d. Mou. Property 41: 4 bedroom accommodation in S.Martinho de Mou. Douro House, your holiday home in the Douro. 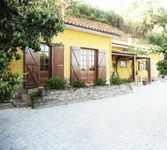 Property 43: Douro House, your holiday home in the Douro. My wife and I celebrated our 25 year wedding anniversary at the Quinta. It's location made it convenient to visit local museums, wineries and Churches. The location also allowed us to explore many nearby small towns for amazing meals and to meet lovely people. Porto is only ~1.4hrs by tollway, which is 90% of the travel. We highly recommend taking the train, just across the Douro in R&eacute;gua, out to Pocinho for a relaxing lunch and walk around the quaint town before returning. The railway view from Pinh&atilde;o to Pocinho is one of the best in Europe! The rooms were nice and well appointed. The mattress and pillows were comfortable. We visited in late November which was cooler temperatures, as typical. We would have liked a heater in the kitchen but admit we are a bit thin-skinned. Joana our host was the most gracious lady ever as well as her mother. Joana responded promptly to all my emails. Her mother greeted us with a freshly baked chocolate cake. The villa was perched on a beautiful mountain side with stunning views. The villa itself was well appointed, very clean with an amazing rustic feel. The only downfall was its local, though 5 miles from the nearest major town with restaurants took almost 30 minutes via narrow mountain roads. We did cook at the villa which was as pleasant as eating out.